Looking back through 2014 I’m actually surprised how much I didn’t make compared to past years. It was a much needed slow year…in a good way. I’ve struggled to find new routine with my kids getting older and needing more of my time and full attention. It’s been harder to sneak away to my sewing room and easier to crawl into bed at 9 instead of sewing past midnight. But that’s life isn’t it? Just as we strike a balance, life changes and we learn to roll with the punches. It was a good year. I had some wonderful opportunities I took, and some wonderful opportunities I didn’t take. That was my motto for the year. I’ve still got work to do weeding out the “everything” and figuring out the “anything” I want to do …but that’s the fun part. Along the same lines this is a really great talk by the author of this book. The Quilts are all so pretty ! started listening to that guy but somehow got sidetracked to Marie Kondo's book The Life Changing Method of Tidying Up. THanks for getting me there! Wow, what a lot to accomplish in a year. Mingle is on my list for this year, I have a coworker having a baby and have some cute bunny fabrics lined up for it. Thanks for sharing your talents and inspiring the rest of us. And Happy New Year! It looks like you accomplished alot to me! I love your work and appreciate all that you share! Thank-You! WTFudge! If I can count correctly that's 24 projects in 12 months! That's amazing-don't be so hard on yourself. That's two a month. I'm lucky if I get one done in a month and I'm retired! Beautiful creations! It's been a good year! Looks like lots of finishes for you in 2014 and every one a beauty. That's such a good mantra to live by. It's crazy and I know I thought people were nuts when they told me how busy I'd get as the kids get older, but it's true. It goes by so fast though, and someday they'll all be in school at the same time at least for a few hours a day. 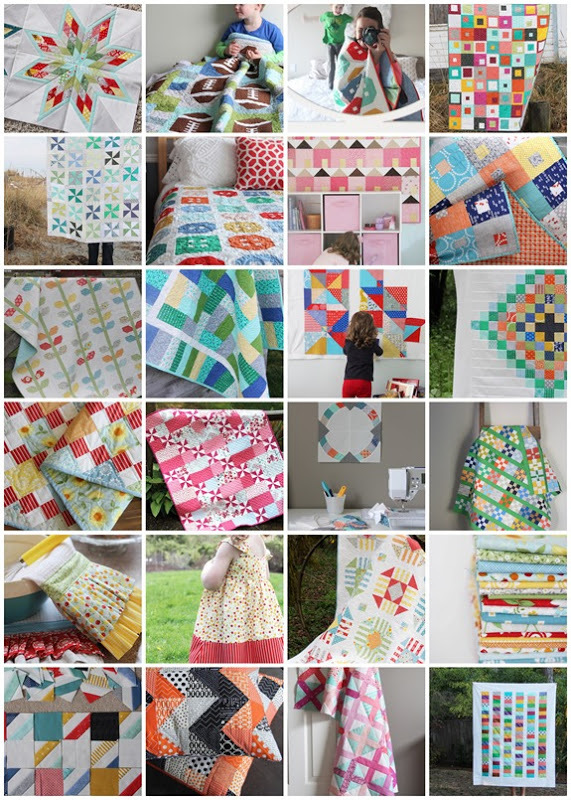 I always love your quilts! Even though I read Greg's book this fall…I'm listening to the talk right now…thanks so much for the link! I'm very impressed with what you accomplished last year. I also know what you are talking about when it comes to kids and needs and our time. Love your blog – you inspire me! What a beautiful collection of makes for 2014! Children are so worth your time. The love and attention you give when they are young comes back to you as they get older and leave home! My grown children so encourage me in my patchwork and quilting now it's heartwarming! Please add to your list of accomplishments all the inspiration you have shared. You get partial credit for 2 of my quilts, for sure. BTW, I'm borrowing your last-year's motto for this year, and I'm starting by swearing off Pinterest. Happy New Year Allison! Hope it's another year filled with your beautiful family and creativity. I agree with Ellen – you have inspired us throughout the year! Thanks so much for your lovely company via your blog too! Wow – you accomplished a ton! If only I could do half that amount – and I don't have little ones around! Yes, reality is a reminder that life does slow us down and we constantly need to be flexible to allow for those changes! Thank you for all your inspiration. Love your blog! I like that motto and your attitude a whole lot better than the spirit of some women who complain that they can't have it all – usually referring to high paced careers and motherhood. Personally, I have neither of those, but I think it quite unreasonable to believe that most – if any – people, women or men, are able to do everything at once; especially while raising children, which is incredibly demanding and completely unpredictable. So more power to you and any other mamas who figure out how to be happy and fulfilled without trying to have it all. Thanks for the video link. I came away with many thoughts and questions. I am sure you did too, especially since you have little ones still at home. It looks like you accomplished so much more than you think you did and shared of yourself with many. Take care of yourself so you can take care of that family. So do what McKeown says<" Explore, Eliminate and Execute" May your New Year be full of joy and laughter.. 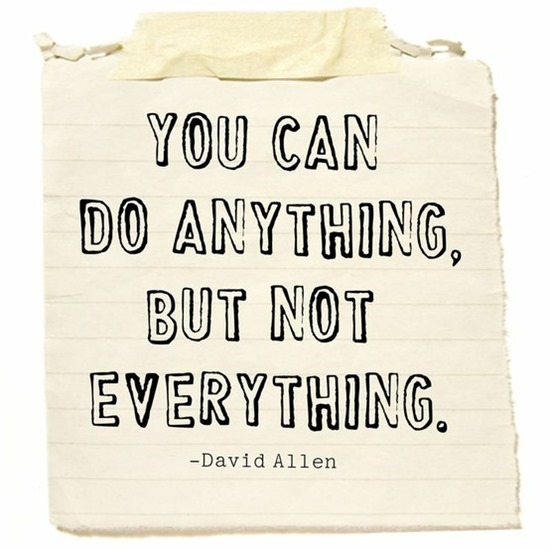 Yes, I am a big believer (and act-er) on not doing everything. Here's to having priorities and even keeping them!!! Happy New year.